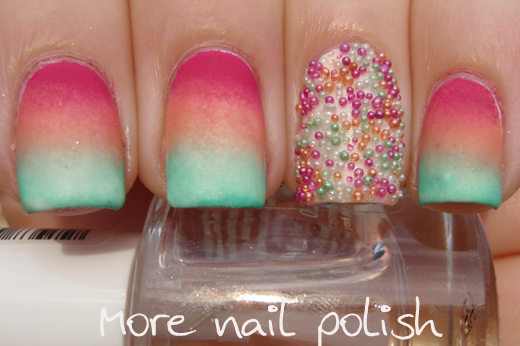 My gradient nails today area based on the colours in the nail stickers on my ring finger. The caviar/micro beads are from Essence Me and My Ice-cream Collection and come in a pack of 16 nail stickers, where the micro beads are stuck to the sticker. I loved that I could create a caviar effect without the hassle and mess of using loose micro beads. I wasn't sure if I should top coat the stickers so I went to bed and showered the next morning and in the process I lost a few beads. I took photos and then applied top coat in case the beads bleed. I'm happy to report that a layer of Seche Vite did not affect the beads colour or appearance, but it helped them from falling off. Next time I will top coat immediately so I don't have gaps in the beads. 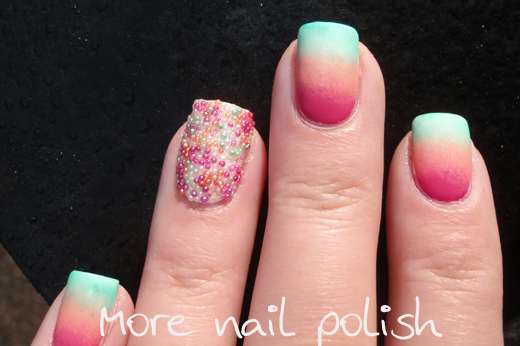 I really like these nail stickers from Essence, I think they are a clever idea. I was going to use the Essence polishes from the Me and My Ice Cream range, which has recently launched in Australia, but the shades are too pale and thin to create a gradient with - especially as I wanted it to match the beads. I'll show swatches of those polishes tomorrow. I ended up using three Picture Polish shades, Flirt, Tango and Honey Dew. I then topped it with G'Day Matte top coat. 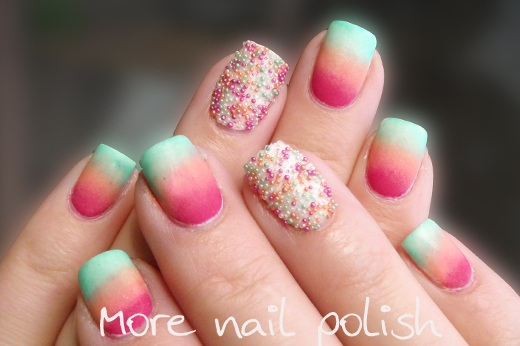 It certainly felt like a fresh spring mani, which is perfect for this warm start to spring we are having. I was quite happy with my gradient as it was smooth through the colour transitions, which is what I really wanted as I wasn't going to hide it behind glitter. Hiding gradients behind a glitter top coat is such a clever technique to disguise imperfections in a gradient. Essence nail stickers provided for review. I love how glowy the whole look is when matteified. It occurs to me that I haven't done matte at all since the challenge started- I really need to do that soon! That was really cute with the matching micro beds. And it was the right decision to matteifie them. This looks so cool! The matte finish really makes it look unique! 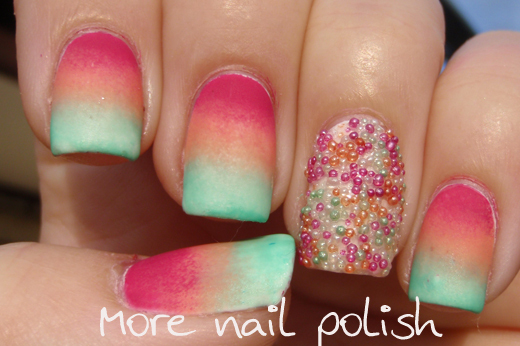 Your gradient looks so smooth and the colors are so cute together! !